LOL. U6 has gone from 15 to 10 since your last foray into Obama's unemployment problems. U3 has gone from 8.3 to 4.9%. Mitt said if he could get the unemployment numbers down to 6%, then he would be a success. If Obama was in the GOP, you'd be trying to rename airports and highways after him. The U-6 shows real unemployment, as was explained, had you thought about the information you read (or didn't read), but that's to be expected from folks who think Obama is wonderful and without fault. I’m not sure why you’d think I didn’t read the column. I was pretty explicit in addressing each different type of unemployment measurement when pointing out just how low those numbers have gotten now since Obama took office. I mean, I can read and look up statistics. I pointed to both the U3 and U6 so, you know, you couldn’t try to claim I didn’t know the difference between the two measurements and then insult me. I mean, I read you so I pretty much expected it. Yet, you tried anyway. .
Black unemployment numbers are down too. U3 for black folks was 16.8 in 2010. Now it’s 8.3. The historical U3 low for black folks is 7.6 (1975). So, we are pretty close to the historical lowest ever number right now. I’m not sure how you can get around those numbers no matter how hard you keep trying. But pointing out that the employment numbers are pretty much half of what they were around the time Obama took office is probably not the route to go. There are serious critiques to be made of Obama, Smokey - you just don’t make them. As I said before, even the previous GOP candidate for POTUS said that if HE could get the U3 number to 6% by the end of his term, then that would be a success. Here you are telling me that 5% is a failure while claiming I can’t read after simply pointing out history. Pretty funny. The "recovery," such as it is, is pitifully slow, the slowest in a long while. Obama could have made it better, but he didn't. 5% U-3 unemployment looks good, of course, because it ignores so much relevant data. 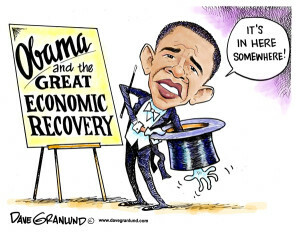 There's no way to excuse the economic tragedy Obama's policies have foisted on Americans, hence the title. I don't expect you to ever agree with what I write, Mr. (or Ms.) Anonymous, but I'm pleased you do read.